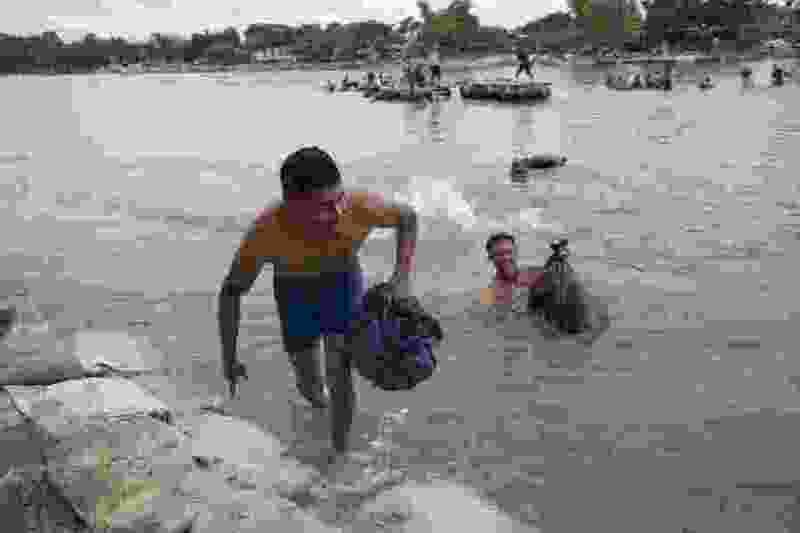 (Moises Castillo | The Associated Press) Central American migrants reach the shore on the Mexican side of the Suchiate River after wading across, on the the border between Guatemala and Mexico, in Ciudad Hidalgo, Mexico, Oct. 20. The migrant caravan is walking to the United States, and the Pentagon is preparing to deploy thousands of troops to support border patrol ahead of the caravan’s arrival. Washington • Eager to focus voters on immigration in the lead-up to the midterm elections, President Donald Trump on Monday escalated his threats against a migrant caravan trudging slowly toward the U.S. border as the Pentagon prepared to deploy thousands of U.S. troops to support the border patrol. His warning came as the Pentagon began executing a support mission dubbed Operation Faithful Patriot to provide military assistance requested by the Customs and Border Patrol. Two U.S. officials said the troop total was likely to be slightly above 5,000, with troops coming mainly from major Army bases from coast to coast. The officials spoke on condition of anonymity to discuss a troop plan that was not yet publicly announced. The Customs and Border Patrol is pushing a surge in personnel in response to the caravan of Central American immigrants, which was still hundreds of miles from the U.S. border, three administration officials said. The military troops are intended to assist the border patrol, not engage directly with migrants, several officials said. The White House is also weighing additional border security measures, including blocking those traveling in the caravan from seeking legal asylum and keeping them from entering the U.S. The troops are expected to perform functions such as transporting supplies for the Border Patrol, but not engage directly with migrants seeking to cross the border from Mexico, officials said. One U.S. official said the troops will be sent initially to staging bases in California, Texas and Arizona while the CBP works out precisely where it wants the troops positioned. U.S. Transportation Command posted a video on its Facebook page Monday of a C-17 transport plane that it said was delivering Army equipment to the Southwest Border in support of Operation Faithful Patriot.